Have you heard of Betterment? If not, chances are you’re living in the financial dark ages. That’s OK; I’ll bring you the light. Betterment is an investment app that is marketed as the perfect option for the busy investor. However, I think their reach goes far beyond that. When I first took a look at the app, it jumped off the screen as a great option for the new investor. To learn more about the intricate details of Betterment, check out the review I wrote here. 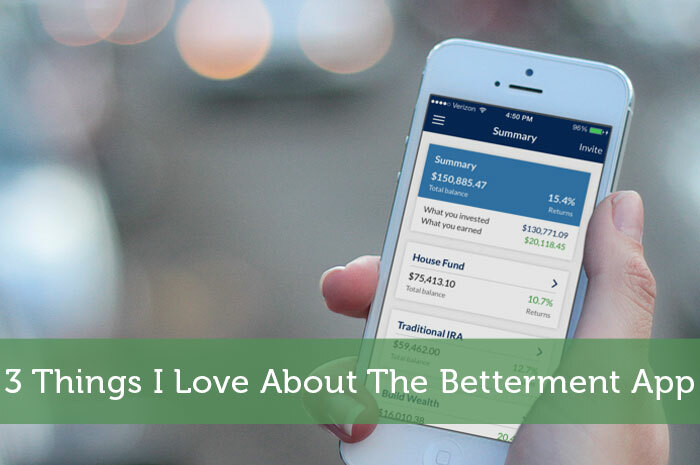 Today, we’re going to chat about the 3 things I love about investing with Betterment. Betterment is all about personal growth. They want to see you make a commitment to long term goals. So they make it easy to set up a way to invest automatically. You can set it up at just about any frequency you’d like. Simply tell the app how much money you’d like to invest and how often you’d like to invest it (daily, weekly, monthly). Once you set it up, betterment will automatically transfer the money from your checking account to your investment account. In any investment, you’re going to run into risk. Betterment is no different. However, they do provide an awesome risk management tool that’s very easy to use. The tool is a simple allocation tool that’s very easy to understand. You set the allocation for stocks and bonds. The higher the percentage of your funds in bonds, the lower your risk. Higher percentages in stocks mean higher risks; at least in general terms. You can also use this tool to take advantage of market trends. If stocks are trending down, allocate more of your money to bonds. If stocks are trending up, allocate most of your money to stocks. OK, so this isn’t a tool you’re going to use, or a chart you’re going to look at. However, it is the most important part of the Betterment app. The reason they can market it as investing for busy people, and I can say it’s for beginners is because you don’t have to choose your stocks and bonds. Instead, experts choose the stocks and bonds that will perform well, and everyone in the system invests in the same nest. The truth is, I hate picking my own stocks, it’s a headache. Having better choose my investments for me is an absolute plus! Also, the amount of time the Betterment way of investing saves me is exponential! Investing can be a headache no matter if you’re an expert or a newbie. Choosing stocks, coming up with performance strategies, and maintaining a portfolio can be enough to drive you crazy. However, with the services Betterment offers, you don’t have to worry about that. All you need to do is set a goal, pledge to make an investment at least monthly, and set your risk level. From there, the experts behind the scene will make your money grow for you. Not to mention, they do it with more than reasonable fees. If you’re looking for an easy way to get into investing, the Betterment app is definitely worth looking into! I love Betterment. It’s a great, low cost way for people to invest so that you are successful with investing – not timing the market, keeping expenses low and diversifying your investments.